TOKYO, Japan, January 28, 2011 (ENS) – The Fisheries Agency of Japan has been forced to apologize for the misconduct of five officials who accepted gifts of whale meat totaling about US$3,000 from Kyodo Senpaku. This for-profit company conducts the collection, processing and wholesale selling of whale specimens and meat from Japan’s annual “research” whale hunt, which is conducted by the Institute of Cetacean Research, a privately-owned, non-profit institution. Two key officials, including the FAJ’s second in command and International Whaling Commission negotiator, Jun Yamashita, were handed warnings, as they were ultimately responsible for the actions of their staff. The apology and warnings were contained in a press release seen by ENS. The release was sent to select Tokyo journalists, but not otherwise published or uploaded to the FAJ website. The agency’s apology and admission of official impropriety is the first time the Japanese authorities have acknowledged the corruption alleged in 2008 by Greenpeace Japan’s Junichi Sato and Toru Suzuki. Today, the Greenpeacers called on Japanese prosecutors to reopen the official investigation into embezzlement within Japan’s whaling program. 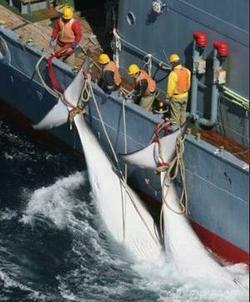 They allege the whale meat was stolen from the Japanese taxpayers, who fund the whaling fleet. Sato and Suzuki are appealing a one year suspended sentence, which was imposed in September 2010 after they were found guilty of theft and trespass for intercepting a box of embezzled whale meat and using it to expose corruption in the whaling industry. In January 2008, Greenpeace began investigating insider allegations that organized whale meat embezzlement was being conducted by crew members from Japan’s whaling fleet, which is funded by Japanese taxpayers. The informer was previously involved in the whaling program, and as a result of his information, Sato and Suzuki found that cardboard boxes containing whale meat were being secretly shipped to the homes of whaling fleet crew members and then sold for personal profit. Sato and Suzuki say their investigation established that more than 23 crew members sent at least 93 boxes of whale meat labeled “personal baggage” to at least 30 destinations. 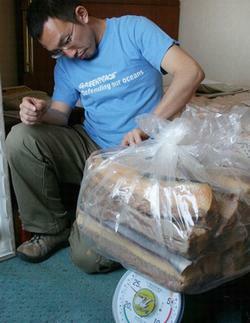 Sato delivered a box of this whale meat to the Tokyo Prosecutors’ Office in May 2008, and filed a report of embezzlement. 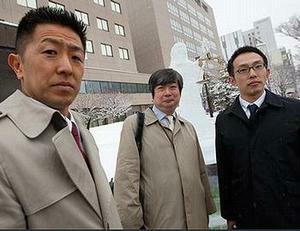 On June 20, 2008 the prosecutors dropped the embezzlement investigation and arrested both men. They were then held for 26 days, 23 days without charge. On September 6, 2010, Sato and Suzuki were convicted of theft and trespass and sentenced to one year in prison, suspended for three years. Last week, Kazuo Yamamura, the CEO of Kyodo Senpaku and head of the Japan Whaling Association, admitted that whale meat sales dropped 30 percent in the first half of the 2010 fiscal year, forcing the association to downscale its activities. His statement was reported by the “Minato Shinbun,” a Japanese language newspaper headquartered in Shimonoseki, home port of the whaling fleet. A press conference in Shimonoseki on January 20 held by by Kyodo Senpaku, the Japan Whaling Association, and the Institute of Cetacean Research, detailed this and other problems facing the whaling industry. The ICR announced that it has reduced the number of its executive directors to one. The current ICR Executive Director Yoshihiro Fujise told reporters in Shimonoseki that the financial model of covering the research costs by selling whale meat as a “byproduct” of the research no longer worked. The Japanese whaling fleet is now in the Southern Ocean Whale Sanctuary hunting whales under a self-imposed quota of 935 minke whales for what the Japanese government maintains is necessary and legal research sanctioned by the International Whaling Commission. Conservationists and whale conservation countries contend that there is no need to kill whales for research and advocate for non-lethal research methods. The whaling fleet is smaller this year than in previous years and is being hounded by ships from the Sea Shepherd Conservation Society, which are interfering with the movements of the whalers to keep them from catching whales.